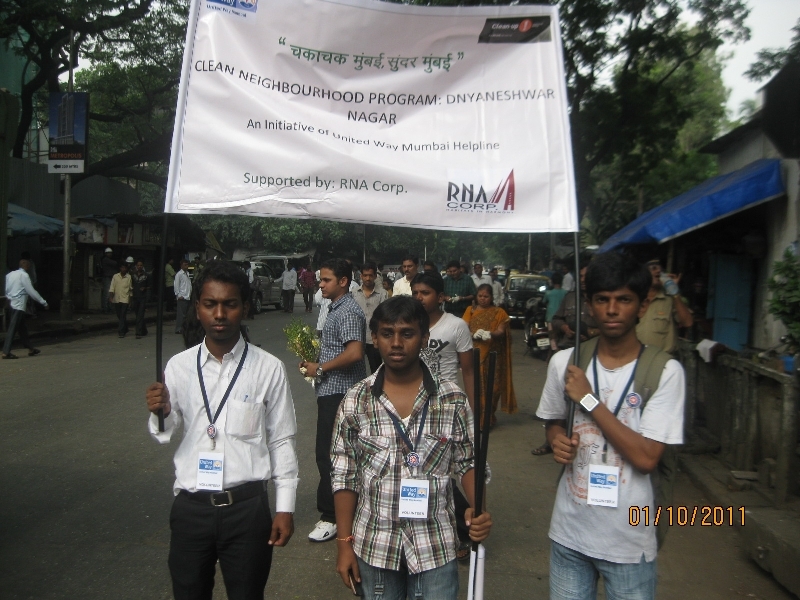 United Way Mumbai Helpline and RNA Corp. launched "Clean Neighborhood Program at Dnyaneshwar Nagar, Sewree in April 2011. 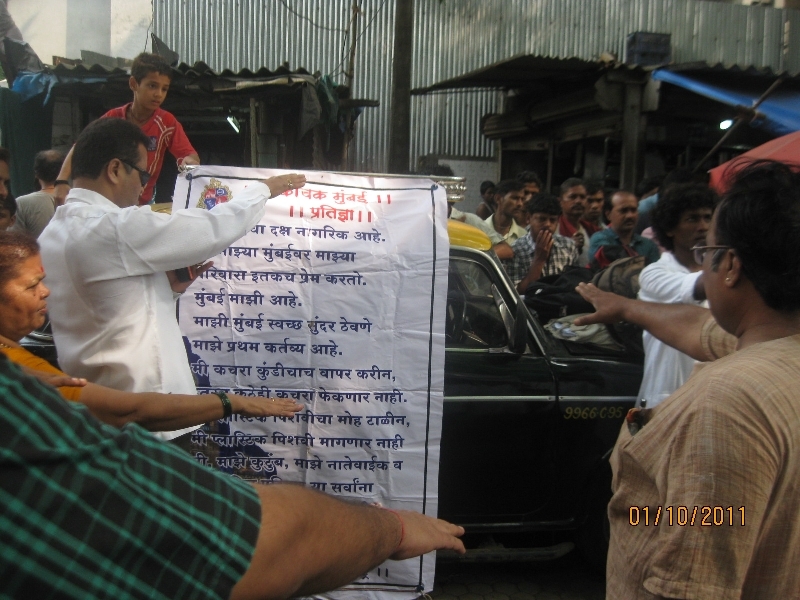 Under this program R. A. Kidwai Road was adopted for the period of one year for maintaining cleanliness and promoting greening of the locality by involving key stakeholders such as local residents, shopkeepers, schools and Municipal Corporation of Greater Mumbai (MCGM) through series of awareness drives. UWMH carried out number of activities to fulfill the vision of maintaining cleanliness in the adopted locality with maximum community participation. "Clean Neighborhood Campaign" launched with the Clean-Up Drive on 30th April 2011 jointly by UWMH, RNA Corp and F South ward, MCGM. Clean-Up Drive was carried out by the participants along with Clean Angan Drives i.e; signing up pledge forms from the shopkeepers for promoting cleanliness. Mr. Bala Nandgaonkar (Hon. MLA of the Locality) inaugurated the launch event. Three Dustbins were donated to the Dnyaneshwar Nagar community members to prevent dumping of garbage on the road. Following the launch of clean neighborhood program in April with the symbolic cleaning at Dnyaneshwar Nagar, Sewree; on October 1, 2011 United Way Mumbai Helpline jointly with RNA Corp. carried out a tree plantation drive. One day prior to the event on 30th September 2011 United Way Mumbai Helpline volunteers conducted a build-up activity wherein, they spread awareness about environment and greenery among the residents and shopkeepers of Dnyaneshwar Nagar and invited them for next days drive. The drive started with the Street play performance on the theme of Clean and Green Mumbai, which received humungous response from the neighborhood. Over 100 people including residents of Dnyaneshwar Nagar community and passer Byers were present during the performance. Two local municipal councilors namely; Mr. Sunil More and Mrs. Parvati Gorivale were present for the drive. Taking up the role of Catalyst of Change, 20 students from the Dnyaneshwar Nagar School from the adopted locality participated in the creation of wall paintings with the messages on better environment and safety to sensitize the citizens on Saturday, 28th January 2011. Armed with brushes and paints, the students communicated their understanding and appeal for better environment to the citizens in creative ways. Students painted pictorial messages on the issues related to cleanliness, Road Safety, Water and energy conservation. Students also interacted with the citizens and appealed them to maintain cleanliness at public premises. UWMH volunteers carried out the plastic free drive in the locality in month of March along with the community survey. Cloth bags were distributed to the citizens to promote the use of cloth bags. At the consolidation of the Program, a survey of adopted locality conducted on 16th March 2012. It is carried out to the study the level of awareness of the residents of Dnyaneshwar Nagar towards the RNA Corp. Adoption of Dnyaneshwar Nagar, Sewree. 51 residents shared their feedback. It is found that most of the residents are aware of the initiatives. Citizens also showed interest to participate in such activities in future. This project as Community Intervention Model has proved to be a high on impact project which is easily scalable and replicable.